The Festival Team is able to offer the hire, delivery, and installation of one, or two large marquees (each is 6 metres x 4 metres). We can only install in Ickenham or very nearby areas, and all arrangements are on a non-contractual, best efforts basis. 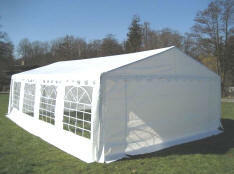 Marquees, 6m x 4m, £100 per day for one, £160 per day for two, including delivery, installation and removal. Covered roof, the side and end walls are optional. Complete with mains lighting if required. The two marquees could be combined to form a marquee 6m x 8m or 12m x 4m. Also need one metre all round for clearance. Use the "Contact Us" button to discuss hire. Here are some other web links that refer to supporters of the Ickenham Festival or to other community activities in Ickenham. The Festival Team are not responsible for the content of these sites. Please do let us know if you would like a link to your site to be added here, or if any link appears to be broken.